An Afghan store clerk shows a calendar with pictures of Afghan leaders including Mullah Mohammad Omar, bottom row, second left, in Kandahar, south of Kabul, Afghanistan, July 30, 2015. The Afghan Taliban on Friday praised their new leader, Mullah Akhtar Mansoor, saying he was one of the most “trusted” associates of the late Mullah Omar, a statement likely meant to rally followers behind the leadership at a time of a deeply fractured insurgency. The historic power transition also raises hopes a more moderate leadership will pave the way for an end to Afghanistan's bloody war. FILE - Mullah Akhtar Mansoor, the newly named chief of the Taliban. The new Taliban leader, Mullah Akhtar Mansoor, is said to be in his early 50s and hails from Afghanistan’s southern Kandahar province, the birthplace of the Islamist group. A member of the Ishaqzai tribe, Mansoor participated in the U.S.-backed Afghan insurgency, widely known as Afghan jihad, against the Soviet Union’s invasion of Afghanistan between 1979 and 1989. Later, he participated in the Islamist armed struggle against the Communist regime of Dr. Najibullah that was installed in Kabul after Moscow’s military departure in 1989. Mansoor joined the Taliban when the hardline Islamist movement, led by its founder Mullah Omar, emerged during the bloody power struggle among various Afghan factions following after the collapse of the Najibullah government in 1992. Afghans with knowledge of Mansoor’s years with the Taliban describe him as a low-level administrator who mostly dealt with organizational matters and was not among the top 10 Taliban leaders at the time. He briefly served as director general of the Kandahar airport and enjoyed the status of a minister for civil aviation till the end of the Taliban regime in late 2001. After the Taliban was driven from Afghanistan and the group launched its counteroffensive, Mansoor was declared the group’s shadow governor of Kandahar and was a member of the Taliban’s leadership council. Omar appointed Mansoor as his deputy and acting head of the shura or leadership council after his predecessor, Mullah Abdul Ghani Baradar, was captured in Pakistan by the neighboring country’s spy agency in early 2010 with the help of the CIA. Baradar, a co-founder of the Afghan Taliban movement, was released in September of 2013 at the request of the then Kabul government. The top official in the Afghan government delegation involved in the peace talks with the Taliban, Deputy Foreign Minister Hekmat Khalil Karzai, has said that the Taliban delegation at the first round of talks had the backing of Mansoor. Sources in Pakistan also assert that Mansoor is the driving force behind the nascent Afghan peace process. The Taliban announcement also said Sirajuddin Haqqani, believed to be in his late 30s or early 40s, will serve as one of the two deputy leaders of the Islamic insurgent group. He is commonly referred to as Khalifa and is heading the Haqqani network of insurgents known for staging some of the deadliest attacks against U.S.-led coalition forces in Afghanistan. The United States has long accused Pakistan’s spy agency, the ISI, of strong ties to the insurgent group. He is a son of Maulvi Jalaluddin Haqqani, the founder of the network, who came to prominence as a U.S.-backed guerilla fighting against the Soviet Union in Afghanistan in the 1980s. Taliban sources say Sirajuddin Haqqani studied in a religious seminary, Mamba-ul-Uloom, that his ailing father had established in Pakistan’s North Waziristan – a volatile tribal region near the Afghan border during the armed struggle against the Soviet occupation of Afghanistan. 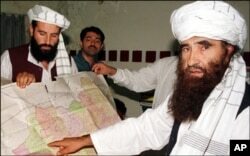 The United States offered a reward of $10 million for information leading to the capture of Sirajuddin Haqqani. A religious cleric known for issuing decrees on behalf of the Taliban, Maulvi Haibatullah Akhund served as deputy to Chief Justice Maulvi Abdul Hakim Akhund and was supervising courts’ administrative affairs until the Taliban was removed from power in late 2001. Little is known about his involvement with the group in recent years.